The background was as follows. The police received a 911 call indicating “that an individual … was yelling for his girl friend and issuing unspecified threats, and that the individual had mentioned a ‘gun.’” The caller provided descriptive information about the individual and his clothing. Officer Delehoy and other officers responded to the location mentioned by the caller, which was in a high crime area. Upon arriving there, Delehoy saw the defendant, who fit the description provided by the caller. “Delehoy told the defendant to remove his hands from his pockets, and the defendant complied.” The officer “then asked the defendant whether he had any weapons on him. In response, the defendant … lifted his jacket, and exposed the grip end of a firearm that was located in his waistband…. The defendant was arrested after he failed to produce a valid license to carry the firearm.” Delehoy “removed the magazine from the firearm and inspected the firearm…. The magazine contained fourteen rounds of ammunition and was capable of holding up to fifteen rounds…. At the time the firearm was removed from the defendant’s waistband, the ammunition inside the magazine was not visible and only became visible when … Delehoy removed the magazine from the firearm. No shell casings were observed in the area where the defendant was arrested, and the defendant made no statement indicating he knew that the firearm was loaded or that it was a large capacity firearm. The defendant did not have any loose rounds of ammunition on his person. During booking, the defendant stated that ‘a guy’ gave him the firearm because the defendant ‘likes guns.’” On appeal from his convictions of possession of a loaded firearm without a license and possession of a large capacity firearm, the defendant challenged the sufficiency of the evidence. 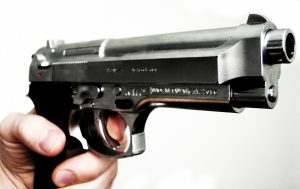 Firearm offenses such as these are extremely serious – they carry mandatory minimum sentences, and on and after time. If you or a loved one is charged with any firearm related offense, it is extremely important that you have an attorney who challenges each and every possible element of the offense. Attorney Daniel Cappetta obtains the best possible outcome for all his clients. Call him for a consultation today.